In March 2016, I started Element Manufacturing and Design, in my basement, with one steady client. EMD provided CAD and mechanical design resources to small companies. In the first year, my business steadily grew. In mid-2017, I began working in the museum and exhibit industry and added a shop to assist my customers with the fabrication of their designs. Around the same time, Adam Greenawalt joined me as a production design manager, and in 2017, we doubled our business. In 2018, we added museum/display clientele to our roster. I began discussions with Virginia Kistler, who has 18 years experience in museum design, and together, we had some ideas for how we could leverage her design experience and our fabrication experience to serve museums and to push into other under-served markets. We are also diversifying our business by offering commercial millwork, as well. We believe that there is a lot of potential crossover between the two markets. With this change in direction, we felt strongly that a name change was in order to better reflect our vision. It is with great pleasure that I announce our new name, EMD Interactives. Over the coming days and weeks, we will switch our email accounts and update all of our social media accounts. Stay tuned as we release more details. We have some exciting things already in the works! 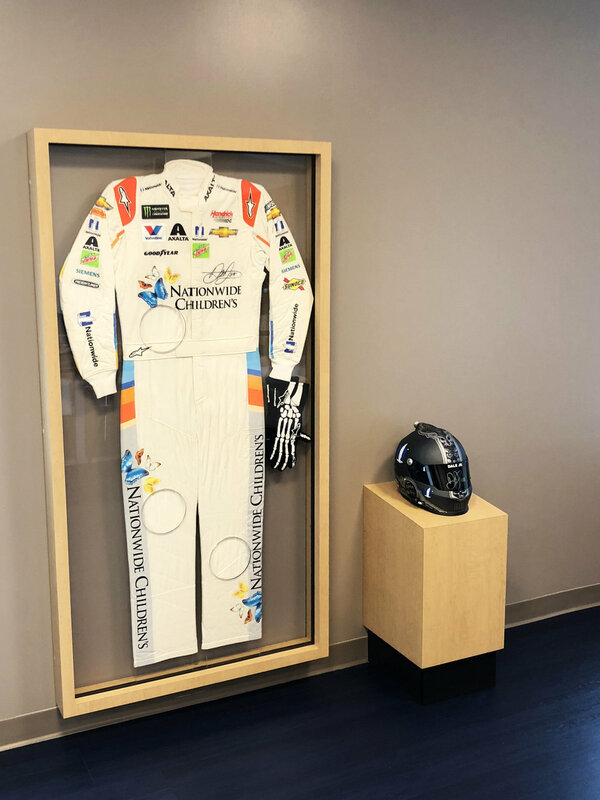 The image is a display we just completed for Nationwide Children's Hospital in the Dale Jr and Amy Earnhardt Activity Room. Thanks to all of you who have supported us this far. We can't wait to see what the future holds for us. EMD Interactives attended the Association for Library Service to Children and debuted the Literacy Light Bright and a catalog of additional interactives! The enthusiasm for interactives was palpable, and we left feeling energized about working with libraries. Many of the ALSC Institute attendees played with our Literacy Light Bright and gave us great feedback! The Literacy Light Bright allows children to play with illuminated, acrylic blocks, while practicing their letter building skills. The blocks are clear acrylic and don’t become illuminated until they are set in place. Children can cycle through the different colors by pushing a button to illuminate the clear blocks with colored LED lighting.